The Coat o Airms o Maltae is the emblem o the kintra o Maltae. The present coat o airms is describit bi the Emblem an Public Seal o Maltae Act o 1988 as a shield showin an heraldic representation o the naitional banner; abuin the shield a mural croun in gowd wi a sally port an five turrets representin the fortifications o Maltae an denotin a Ceety State; an aroond the shield a wreath o twa branches: the dexter o Olive, the sinister o Palm, seembols o peace an tradeetionally associatit wi Maltae, aw in thair proper colours, tied at base wi a white ribbon, backed reid an upon which are written the wirds Repubblika ta' Malta ("Republic o Maltae" in Maltese) in caipital letters in black. The naitional coat o airms an aa appears on the banner o the Preses o Maltae, as well as on the 10c, 20c an 50c Maltese euro coins. 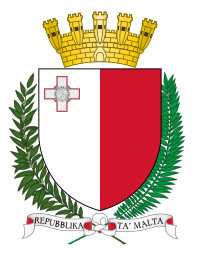 Wikimedia Commons haes media relatit tae Coats of arms of Malta.